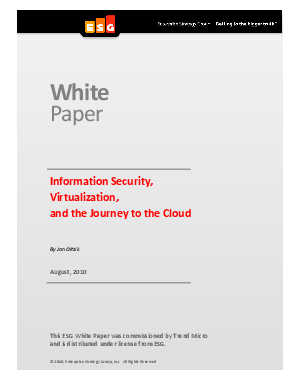 White Paper Published By: Trend Micro Inc.
Gain Confidence in the cloud. You can't wait to reap the full benefits of virtualization and cloud computing. But hold on. In a new white paper, ESG Research warns you to prepare now so you won't be sorry later. Find out what you need to do to vaporize your risks as you take to the sky from virtualization to cloud computing. "Smart CIOs will make sure to evaluate the roadmaps and development plans of leading technology vendors so they can pick the right partners for the virtualization and cloud journey that lies ahead."